Definition - What does Dominant Follicle mean? A dominant follicle is a fluid-filled structure in the ovary that grows big enough to release a mature egg around day 14 of a normal regular menstrual cycle. A dominant follicle can reach a size of 25 mm. A dominant follicle is also called a graafian follicle. 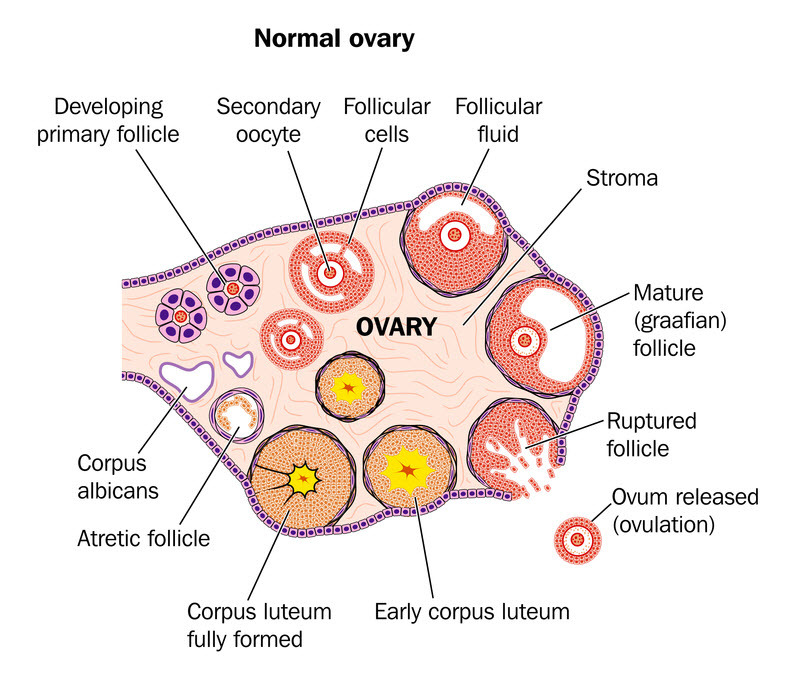 Before puberty, the ovary contains thousands of follicles, called primordial follicles. However, with the onset of puberty, only 15-20 primordial follicles begin to mature each cycle. This process is referred to as follicular recruitment. Only one of the 15-20 recruited follicles becomes a dominant follicle, which is capable of expanding and releasing a mature egg. The cells in the dominant follicle produce estrogen. The rest of the follicles shrivel up and die. When the dominant follicle reaches 2 to 4 cm in diameter, it bursts to release the egg, marking the onset of ovulation. After ovulation, the dominant follicle partially shrivels and is now called as corpus luteum. This collapsed cyst produces progesterone during the last phases of the menstrual cycle. What triggers the formation of a dominant follicle? When a menstrual cycle begins, a part of the brain called hypothalamus releases gonadotropin-releasing hormone (GnRH). GnRH acts on the pituitary gland, which in turn secretes follicle-stimulating hormone (FSH) and luteinizing hormone (LH). These hormones induce the maturation of the recruited follicles and eventually the formation of a dominant follicle. During an IVF cycle, more of the recruited follicles are allowed to mature by using high concentrations of FSH, as opposed to the natural development of a single dominant follicle during a normal menstrual cycle. This process is often referred to as superovulation. The development of a single dominant follicle, however, is still possible and contributes to IVF failure. Aspiration of the dominant follicle in these instances can help achieve a viable pregnancy.